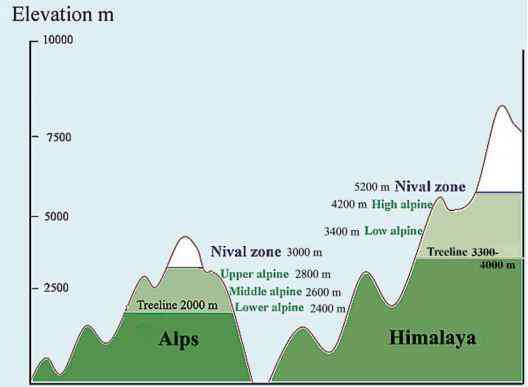 The definition of alpine vegetation as the plant communities that are found between the upper limit of tree growth and the snowline (nival zone) is used globally. As might be expected in any global categorization many differences can be found between the species that inhabit this broad zone in various parts of the world. Variation in the alpine environment is not just a question of temperature reduction with increasing altitude. Aspect, exposure, snow cover and water availability also play a role in controlling species distribution. In different parts of the world the nature and extent of these factors with increasing altitude impose their own particular set of controlling conditions on plant zonation within the alpine zone. Floras also differ in the number of species that have a wide altitudinal range and those in which the altitudinal range is more restricted. Despite these regional differences there are usually a number of dominant species which can impose a structural change on the vegetation that differs in its impact in relation to altitude (Fig. 10.22). In temperate and boreal regions the nature of the dominant woody and graminoid species makes for a distinct altitudinal pattern within the alpine zone. Frequently three sub-zones can be seen merely from visual inspection. In these regions the normal pattern is for rainfall and cloud cover either to increase or remain unchanged with increase in altitude, which causes the limits to the differentiation of plant communities in relation to altitude to be largely determined by temperature. The zones that are most frequently recognized are listed below. Compared with oceanic Scotland the vigorous and widespread mountain willow zone on exposed mountainsides and luxurious tall herb communities in more sheltered areas in Scandinavia is very striking. This is especially so as attempts to restore the willow communities on Scotland's most species-rich mountain, Ben Lawers (1214 m, 3983 feet), have had very limited success. In this zone, graminoid (sedges and grasses) and heath species dominate, as can be seen in Scandinavia and Scotland. Heathlands are better developed in Scotland, due to the oceanic climate and the longstanding lack of forest. The large-scale removal of the upper forest and the montane willow zone has allowed the heath species of the middle alpine zone to extend downhill and create the Calluna vulgaris dominated heather moorland that typifies the Scottish Highland landscape. For some Scots the landscape is the glory of Scotland but for those with some perception of what has been lost biologically over the millennia it represents a wet desert, low in biodiversity and impoverished in its soils and productivity (see Darling & Boyd, 1964). The zonation on tropical mountains is notably different and does not parallel that which is found in temperate regions. On tropical and subtropical mountains the entire zonation sequence is less abrupt. In East Africa the dry mountain forests typically flourish up to the top of the cloud zone, but above this region precipitation decreases at varying rates depending on location. In the Andes the eastern side of the mountain range descends into the Amazonian rainforest and precipitation is less limiting than on the Pacific side. In general, however, where there is a diminution in precipitation and water becomes a limiting factor, tree cover gradually diminishes. Snow and ice-capped Kilimanjaro, the highest mountain in Africa (5895 m), still shows some volcanic activity with the presence of many fumaroles. In recent years, the permanent ice cover has been noted to be decreasing rapidly. Over the twentieth century, the areal extent of Kilimanjaro's ice fields decreased by 80% and if current climatological conditions persist, the remaining ice fields are likely to disappear between 2015 and 2020 (Thompson et al, 2002). In March 2005, it was reported that the peak was almost bare of snow and ice, for the first time in 11 000 years (The Guardian, 14 March 2005). Not surprisingly Kilimanjaro and its vanishing glaciers have become an 'icon' of global warming. However, the justification for this has been questioned. While many parts of the world have warmed in the last two decades, satellite data have shown that Kilimanjaro itself has cooled. The ice is still disappearing, and it is now thought that a local climate shift that occurred 120 years ago may be responsible. Field observations and climatic data suggest that factors other than air temperature directly control the ice recession. In particular it is suggested that a drastic drop in atmospheric moisture at the end of the nineteenth century and the ensuing drier climatic conditions are the likely factors rather than a rise in temperature in forcing glacier retreat on Kilimanjaro (Kaser et al., 2004). On Kilimanjaro, precipitation peaks with 2000 mm at an altitude of2200 m and then drops sharply above the upper cloud zone to 220 mm at 4200 m producing an alpine desert. This pattern is also repeated on other high tropical mountains. The temperature conditions in this alpine zone are strikingly different from those on temperate and boreal mountains. In the latter, seasonal temperature differences are large and diurnal fluctuations small. On the Zugspitze (2964 m a.s.l.) in the Alps the mean diurnal temperature is about 5 °C with a seasonal monthly range of 13 °C. 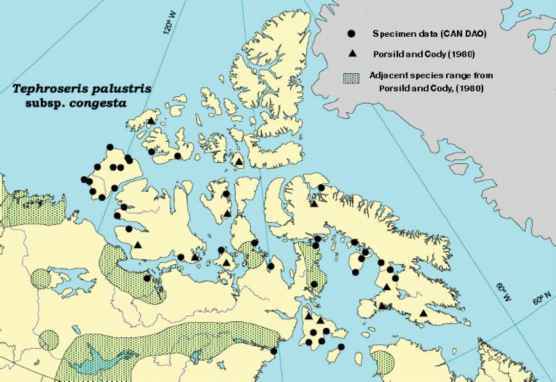 In boreal and temperate zones the large range of seasonal temperature differences causes a thermally induced seasonal phenology to differentiate the vegetation of the entire alpine zone into subregions that are adapted to different lengths of growing season. The result is the development of the lower, middle and upper alpine zones as described above. On tropical mountains, however, seasonal temperature differences are minimal and the seasons if any are distinguished on the basis of precipitation patterns and not temperature. 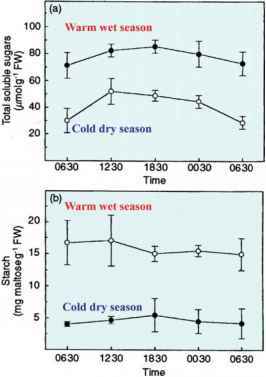 Instead of a seasonally imposed stress there is a gradient of greater drought with increasing altitude coupled with freezing night temperatures at increasing frequency and strong insolation by day. These conditions impose gradual changes on the vegetation within the alpine zone. In these alpine deserts many species exhibit specialized morphological and physiological adaptations that aid drought and cold tolerance and were discussed above (Section 10.4). On Kilimanjaro the upper level of the cloud forest lies at approximately 2800-3000 m. Above this lies a gradient of changing ecological zones (Hemp, 2006). Irrespective of the method of vegetation recording, four major altitudinal discontinuities can be recognized. (1) An Erica excelsa dwarf forest (2800-3050 m) with many woody shrub species belonging to the Ericaceae and Proteaceae from 2800 m up to the lower edge of the alpine zone at 3300-4000 m. At the upper region of this zone there is a restricted elfinwood formation (a tropical mossy krummholz). (2) A lower alpine zone (3300-4000 m), a region of lower rainfall with sparser vegetation. The lower altitudes are characterized by giant groundsels (Senecio spp.) and giant lobelias. (3) An upper alpine desert (4000-5000 m), a harsh, dry, windy region, consisting mostly of bare rock and ice. Plant cover is minimal and consists mostly of lichens and small mosses. At certain times of the year snow covers the area. (4) A summit zone from 4600 m consists of frost-shattered rock and mosses and lichens which are found right up to the summit (5895 m). Specimens of Helichrysum newii have been recorded close to a fumarole at an altitude as high as 5760 m.
Many species occur through more than one zone. Two distinct forms of giant groundsel occur on the upper mountain: Senecio johnstonii ssp. cottonii, endemic to the mountain and only occurring above 3600 m, and S. johnstonii ssp. johnstonii which occurs between 2450 m and 4000 m. At all altitudes Senecio favours the damper and more sheltered locations, and in the alpine bogs is associated with another conspicuous plant, growing up to 10 m tall, the endemic giant lobelia (Lobelia deckenii). The enormous north-south extension of the Andes from 9° N in northern Colombia to 56° S in the Tierra del Fuego provides a ready means of comparing tropical and cool temperate high-altitude areas in relation to the ecology of high-altitude vegetation. Despite many similarities between the mountain zonation in South America and East Africa there are also distinct differences reflecting the very different geological histories of the two continents. From Ethiopia to South Africa there is a disjunct series of individual peaks and ranges with different ages, origins, and geologies. African mountains tend to be more or less islands whereas in South America, the Andean Cordillera to the west forms a continuous range of mountains together with very extensive high altitude tablelands. To the east there is a notable collection of inselbergs with varying degrees of floristic isolation (Section 10.2.2). Within the tropical zone a high-altitude grassland zone, dominated by bunch grasses (Calamagrostis, Festuca spp.) usually referred to as paramo, is widespread through Colombia, Venezuela, Ecuador, northern Peru and parts of northern Argentina where there is high rainfall and humidity throughout the year. This contrasts with the puna which has a prolonged dry season that increases in aridity from north to south and from east to west (Troll, 1959). The two types merge with each other and constitute the vast area of high-altitude Peru and Bolivia, popularly known as the Altiplano. In the Old World the equivalent of the Altiplano is found in the Ethiopian tableland and the high-altitude steppe of Tibet (Vuilluemier & Monasterio, 1988). In the tropical to subtropical regions of the Andes, principally in Peru and Bolivia, the high-altitude zones have long been exploited for grazing. There are even historical records from the time of the Spanish Conquest (1528-31) that the flocks of llamas and alpacas were so large that grazing could not be found for them (Garcilaso de la Vega, 1608). Historically therefore, the upper limit of the treeline (4500 m) has been depressed by biotic factors and most of the land over 4000 m has been treeless for a very long time (Crawford et al., 1970). In the high-altitude plains of the Andes there is one outstanding exception to the general absence of trees and that is high-altitude forest patches dominated by Polylepis spp. The genus Polylepis comprises a group of tree species belonging to the rose family. Fifteen species of Polylepis grow in South America and occur from northern Venezuela to northern Chile and Argentina. The highest number of species is found in Ecuador, Peru and Bolivia. 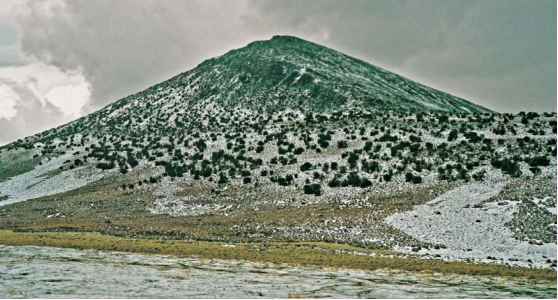 The highest locations, however, occur on the long extinct Bolivian volcano Sajama (6542 m; Fig. 10.23), which can claim to have the world's highest forest with occurrences up to 51005200 m (Purcell et al, 2004; Hoch & Korner, 2005; Figs. 10.24-10.26). This altitude record is well in excess of other possible arboreal alpinists. In southwest China, silver fir (Abies squamata) has been recorded at 4600 m with heights of 15.2 to 36.5 m, and in the Himalayas, the Indian paper birch (Betula utilis) has also been found at this altitude (Duncalf, 1976). 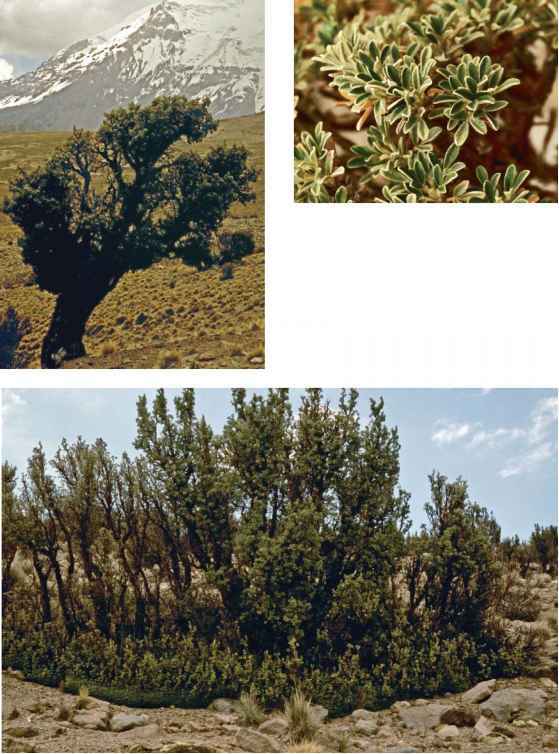 The growing season for the high-altitude Polylepis trees is extensive, extending over 265 days with minimal seasonal variation in soil temperature (Fig. 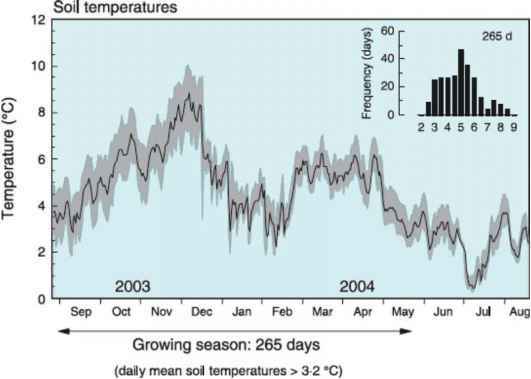 10.24) and no evidence of carbon depletion in their shoots despite the high altitude (Fig. 10.27). the significant rise in total soluble sugar and proline contents during the wet warm season (Fig. 10.27). The trees in the altitude-record-holding location are therefore highly frost tolerant, and especially so during periods of metabolic activity in the warm wet season when night frosts are always a hazard at this altitude (Rada et al., 2001). and Stipa) forming tussocks that can reach 1 m in height (if not burned or grazed). In the dry puna, Festuca orthophylla predominates. In the wet puna on the Eastern Cordillera, several species of Cortaderia can be important particularly along watercourses. Spaces around the tussocks are often filled by a number of herbs, including non-tussock-forming grasses and sedges, prostrate or low-growing forbs, lichens, mosses, and ferns and their allies such as Jamesonia and Lycopodiella. Up to 4400 m, especially in the moist puna of the Western Cordillera, some forest patches dominated by Polylepis spp. can also be found. (2) True puna, above c. 4200 m: grasses begin to lose their dominance on well-drained substrates. The altitudinal zone between 4200 and 4800 m is sometimes described as the true puna. Here the predominant life-forms in grazed areas are prostrate, cushion and rosette herbs of genera such as Azorella, Baccharis, Daucus, Draba, Echinopsis, Gentiana, Geranium, Lupinus, Nototriche, Plettkea, Valeriana and Werneria. Elevations above 4800-5000 m have vegetation types with these same taxa dispersed as individual plants. Often bare ground predominates, especially on scree slopes made unstable by needle-ice (Smithsonian Museum, 2006). As is evident from the above descriptions the species in these upland regions have wide altitudinal ranges. A detailed numerical analysis of seasonally dry mountain scrub carried out in the Vilcanota Valley in Peru identified the main constituents of high, middle, and low, altitude groups and showed that notwithstanding the existence of particular species combinations at different altitudes many species were widespread in their alti-tudinal distribution. Here again the dominant factors are moisture, grazing and erosion rather than temperature (Crawford et al, 1970).